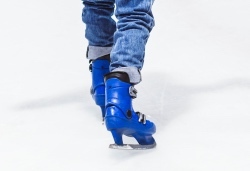 Where’s London’s oldest…ice skating rink? The ice skating season is upon us so we thought it timely to take a look at where the oldest rink is located. QUEENS: Skate, Dine, Bowl at 17 Queensway in Bayswater houses what’s generally said to be the oldest surviving ice skating rink in London, having opened its doors as QUEENS Ice Club on 3rd October, 1930. It was the work of architect and entrepreneur Alfred Octavius Edwards who apparently had a passion for ice skating. It was apparently the first rink used by the BBC for televised ice skating and a number of world and Olympic champions have skated here. The establishment underwent a revamp a couple of years ago (although bowling lanes were added as far back as 1994) and now features a wide range of amenities including, as well as the ice rink, bowling lanes, a vintage games arcade and bars and a diner. For more on Queens, see https://queens.london.